Burgundy, orange, yellow and brown fill the hills with color, making a beautiful backdrop for your wedding. The crisp autumn air and cool, gentle breeze are perfect accessories to your reception. The fall themed Hershey chocolate wedding favors are the perfect accompaniment to this exquisite display. 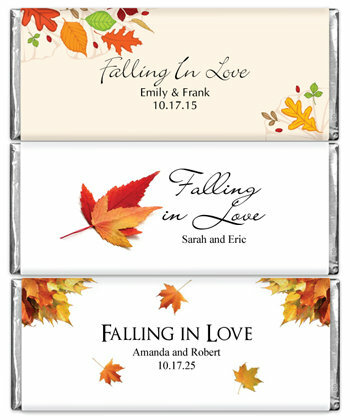 Available in 5 fall designs that complement your decor, these unique wedding favors come in 1.5 oz bars that will make your guests smile. A classic treat, the fall themed Hershey chocolate wedding favors are a magnificent gift for your guests.